The rates featured below are basic hourly rates to give you a basis to start with. Our yacht charter coordinators and captains are very flexible and can customize a package for your event or occasion based on your needs and desires. Additional accommodations can be made for catering, cocktails, and entertainment. 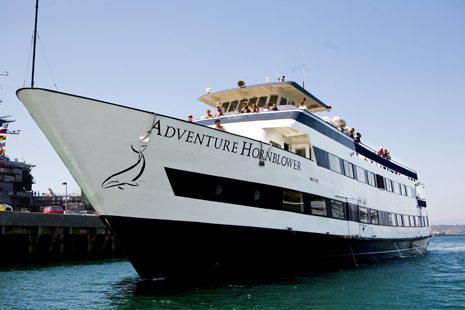 Boarding of the Adventure Hornblower can be at the Harbor Drive Hornblower terminal or at another location of your choice (depending on vessel space availability, additional docking fees may apply for remote locations). Typical San Diego Harbor cruises entail a relaxing bay tour featuring photographic points of interest such as the San Diego Skyline, Point Loma, Seaport Village, the USS Midway, Star of India, and the Coronado Bay Bridge. Prices do not include marina dock fees and San Diego Port District taxes, sales taxes or additional services such as food & beverage or other incidentals unless otherwise noted. Prices are subject to change from published rates. Each charter may be different and your special requests are welcome. Gratuities for the captain and crew are NOT included in the published rates, but are cheerfully accepted and appreciated. The Adventure Hornblower is a 150 foot mega yacht that offers magnificent views of the San Diego skyline from the sun deck. Panoramic windows throughout her four unique salons allow your guests to enjoy these same views from the climate controlled interiors. Socialize at one of the three bars, enjoy the state-of-the-art sound system or dance the night away in the Main Salon. Adventure is certified for ocean cruising for whale watching. 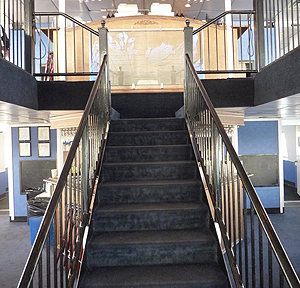 Adventure is a spacious 85′ modern motor yacht featuring climate controlled passenger salons, panoramic windows providing 360 degree views of San Diego Bay, retractable sunroof, dance floor, lounge area, full service galley (kitchen), and an ADA Compliant boarding ramp (at most boarding locations). 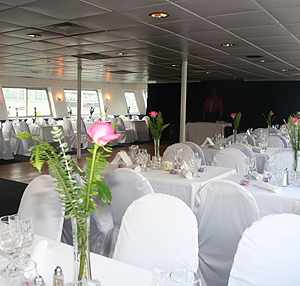 The Adventure is ideal for large parties, dining or cocktail cruises, weddings, and corporate events. Although the rated guest capacity of this yacht is 550, she can comfortably seat 150 guests for dining. She has fully stocked bars with glasses, restroom facilities, and a spacious open-air upper and aft deck, and bow for excellent harbor viewing. 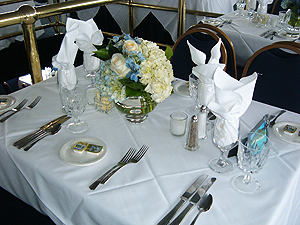 Whatever your occasion to charter a private yacht from San Diego Bay Cruises, the Emerald motor yacht is ready to accommodate your event and your party. Comfortable deck seating throughout the vessel. There’s not a bad seat in the house!